Let me start by saying today is ISKAndals.com’s 7th birthday. Woo hoo! And yes, I totally forgot about it. My son saw my blog earlier and asked how many recipes I’ve posted and when did I start blogging. I answered “approximately 350 since 2005 with more than a year hiatus” (2011). He said it’s not that much considering 7 years and that I should multiply that number by 7 and that’s a more appropriate quantity. We had quite a lengthy discussion about it and after a while it finally dawned on me. It was actually the eve of this blog’s anniversary! Wow. Can’t believe I am still enjoying this. Yeah yeah I had my share of busy-lazy phase but I’m back (and Erwin’s back!). Anyway, I don’t have anything special to say or give away unlike previous anniversaries. I feel I need to write something but all I have are the scribbles on my notebook. Yes I keep a real notebook where I write what I plan to cook and what I’ve cooked, the same way I have a sketchbook for my design concept and sketches. So let me just share our dinner last Sunday. 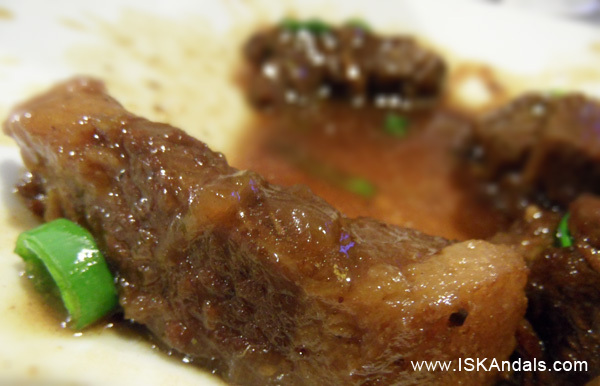 Let’s talk about Pares. During the late 80s to early 90s (oh how I hate to say this), an inevitable part of being a Thomasian was a trip with friends to Jonas at Mayon, Quezon City just to have beef pares. That was my first taste of the famous dish and the place was always fully packed. More than a couple of times I have tried to replicate this dish to no avail. 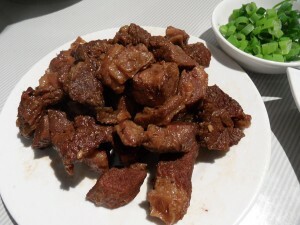 I do braised beef with ‘safe’ flavors to make beef toppings. Yum but not ‘pares’. There IS a difference. 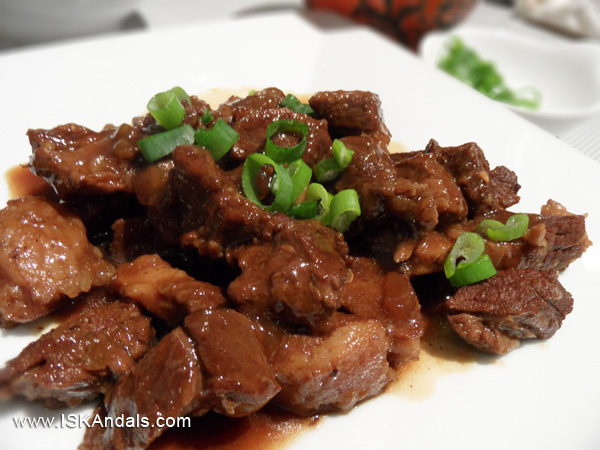 One of the reasons is that I was too scared to use ingredients with what I call strong Chinese flavors like star anise and five-spice. Not that I haven’t used them before but having lived in Beijing for more than 5 years the aroma coming from all the food in a restaurant there could be pretty overwhelming I didn’t even want to have it at home. Well, things have changed. 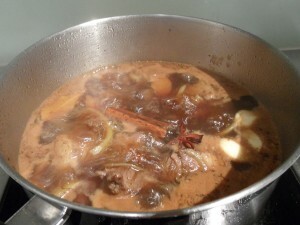 Earlier this month, Erwin posted his take on beef noodle soup using tendons. 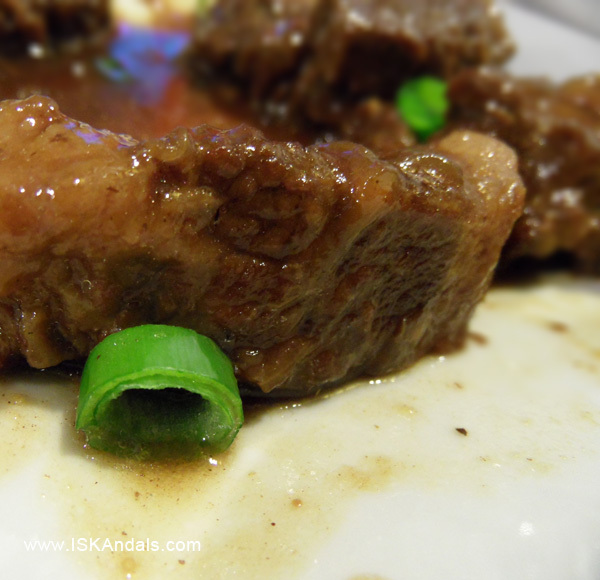 I tried it using beef shin, followed his cooking process almost by heart and the result is a flavorful broth that reminds me of beef pares. A light bulb flashed above my head. Why not? I have no idea how the original Jonas beef pares was cooked but I’m pretty sure my flavors are perfect. 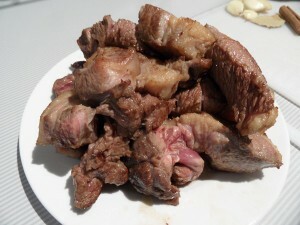 I couldn’t find beef brisket when I went to the market so I ended up buying beef casserole chuck steak, which has fat and tissues similar to beef brisket. It’s also brilliant that the cooked dish doesn’t leave greasy fat on your lips like you just put on lip gloss. Read: Bagong kain ng lechon. With the amount of each ingredient listed below, you may conclude that I am still wary of the spices. You are free to add more but I think what I’ve concocted with just a little bit of this and that is the trick to make it taste just right. You can also add chili somewhere in between the process if you like a spicy kick. Heat a tbsp of oil in a pot. 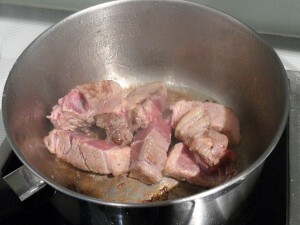 Pan-fry beef in batches until browned. Scoop out and set aside. 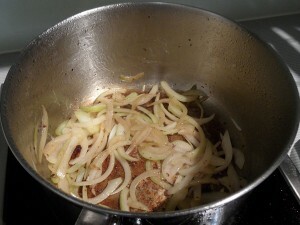 Add a bit of oil to the same pot and sauté onions until caramelized. Pour stock to deglaze. 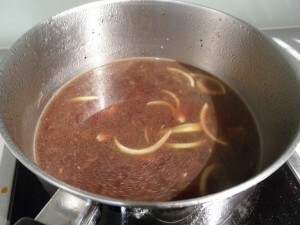 Add soy sauce, oyster sauce, cooking wine and sesame oil. Bring to boil. 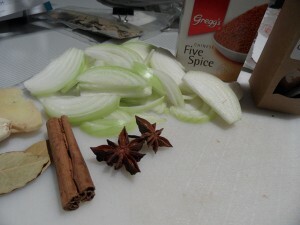 Lower heat and throw in ginger, garlic, star anise, peppercorns, some freshly ground pepper, bay leaves and cinnamon stick. Dump in the browned beef as well. 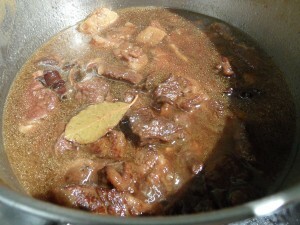 Simmer, adding more stock if necessary, until beef fat is melt-in-your-mouth tender but the meat is just right – not falling apart. It took about 1½ to 2 hours. Scoop out beef pieces and transfer to a serving platter. 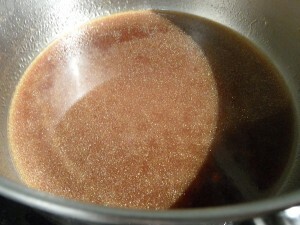 Strain broth through a sieve or strainer to remove chunks and return broth to the pot (should be cleaned of bits and pieces as well). 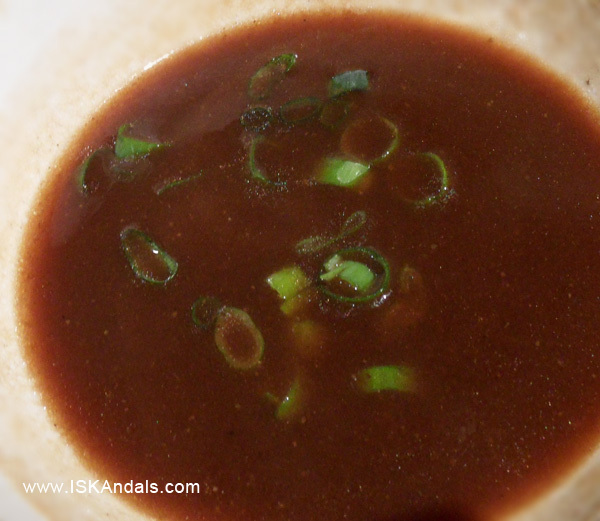 Broth should be at least 2 cups if you like more sauce like us. Bring to boil then simmer. Combine cornstarch with little water in a small bowl. Stir to dissolve and set aside. 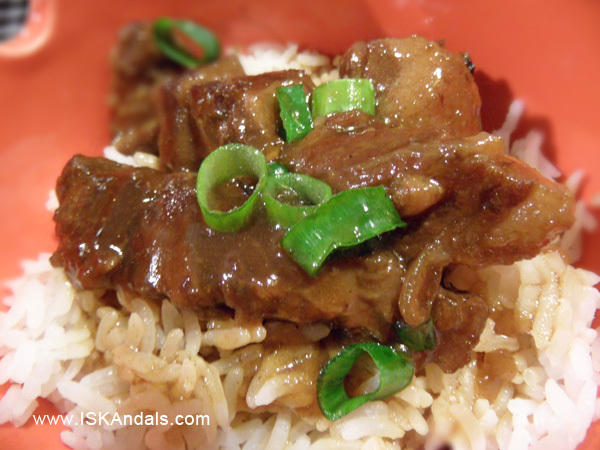 You may also start scooping steamed rice into rice bowls and arranging beef pieces on top. 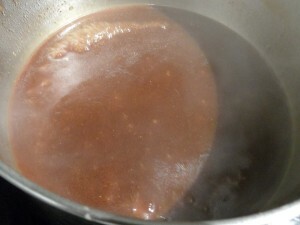 Add brown sugar, cinnamon powder and five-spice powder to the simmering pot. Taste. I’m pretty sure it’s just right at this stage but feel free to season more with soy sauce or anything you want. Simmer for about 5 minutes. 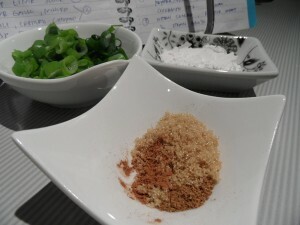 Pour cornstarch mixture and stir until the sauce thickens. Remove from heat. 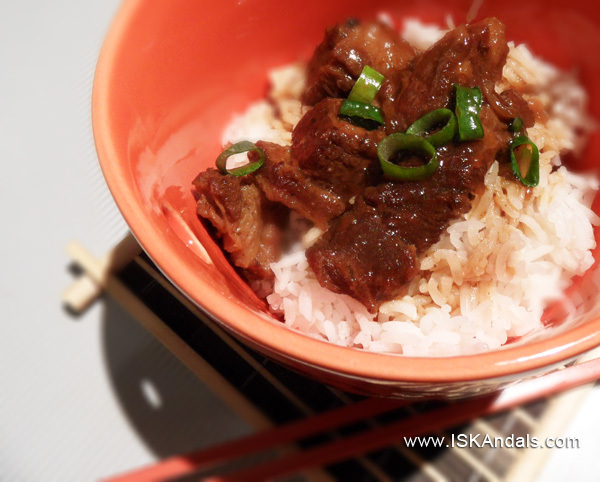 Drizzle over cooked beef and garnish with spring onions. Yum! Yum! This is a favorite though I haven’t tried to cook this yet. THanks for the recipe. And Happy 7th Anniversary! Cheers to more food and recipes! that looks yum!!! !now i’m craving for some pares;)!! !btw congrats on ISKAndals anniv…! Hahaha! Basta tanda ko lang ang exact date kasi. This is easy, don’t worry hehe.